Bollywood stars enjoy being super popular in Pakistan. Whenever their die-hard fans here get a chance to interact with them on social media, the first thing that they want to know is, will they ever visit Pakistan? First, it was Arjun Kapoor, the Gunday star, who shared on Instagram during an interaction with his fans that he hopes to visit Pakistan. Now, we have another Bollywood celebrity Athiya Shetty, daughter of Sunil Shetty, who revealed that she would love to visit Pakistan one day! The Hero actress had a Q&A session with her followers on Instagram where one of her fans asked her that if she would ever visit Pakistan. To which Athiya replied that she’s heard it’s beautiful and she would love to visit here someday. Athiya added that she wants to visit our JPNA 2 girl Mawra Hocane as well. Athiya’s response reached Mawra who wholeheartedly welcomed her to Pakistan. Mawra posted the screenshot of Athiya’s message and said that she will love to show her around! Have a look at Mawra’s response! Mawra Hocane made her Bollywood debut in 2016 with Sanam Teri Kasam and have got herself some admirers on the other side of the border. 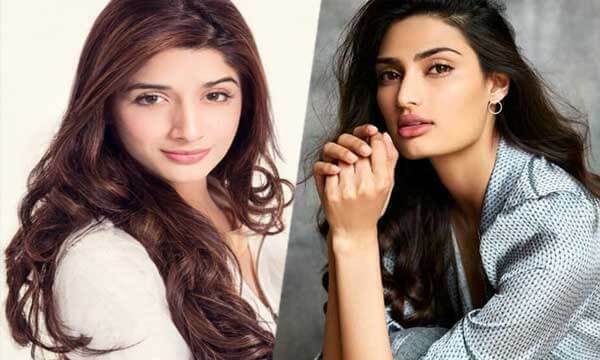 Prior to the release of Jawani Phir Nahi Aani 2, Athiya Shetty and Harshvardhan Rane, Mawra’s co-star in Sanam Teri Kasam, sent their best wishes to the JPNA 2 girl. It’s just heartwarming to see such admiration and support among Pakistani and Bollywood stars irrespective of the borders. 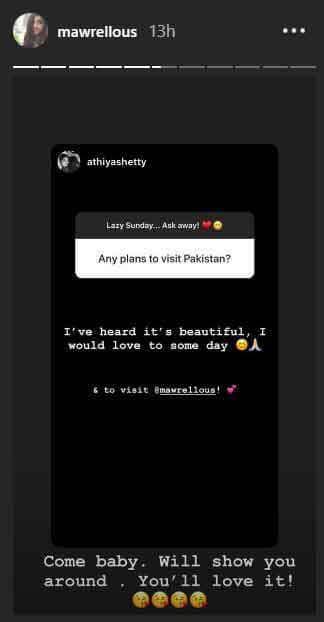 We will be really excited if Athiya Shetty ever comes to Pakistan and we are sure our JPNA 2 girl will make her visit worth to remember.